Within the last few years, Kaz, Inc., which owns the Honeywell air purifier brand, has undergone consolidation under a series of owners. "Honeywell" air cleaners have around $400 million in sales worldwide, a top-selling brand. 2.) a brisk aftermarket flourishes, with knockoff-generic filters sometimes represented as "Honeywell." Kaz once used a numbering scheme (i.e. "38002"), for hundreds of different replacement filters, which was easily preempted by aftermarket vendors. Amidst an industry downturn, Honeywells were switched to a modular filter plan which standardized nomenclature and packaging, and reduced the total number of different filters sold. This also made the counterfeits, which still sell well, easier for shoppers to spot. Most genuine Honeywell OEM filters now feature distinctive red/white packaging and the prefix "HRF-" in the model number. Generics save money, but can have wider variations in quality and multiple revolving-door vendors, than genuine OEM replacements. But, in my opinion, the quality of genuine Honeywell OEM filters and pre-filters has been slipping of late, narrowing the gap with the uppermost generics. Prefilters are a fat cash cow, and Kaz and generic vendors are making the most of the opportunity. The best way to be sure you're getting real OEM pre-filters is to buy from the kaz.com website. Amazon.com offers lower prices, and wider selection including generic alternatives, but also features many third party vendors. 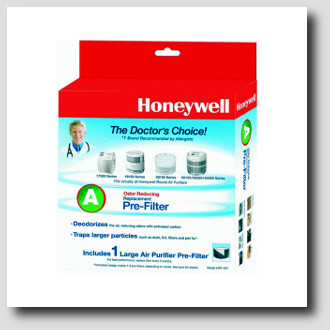 HRF-AP1 is Honeywell's "Universal" Carbon Air Purifier Replacement Pre-Filter, this replaces old pre-filter numbers 38002, 32002, 33002, 34002 and 35002. Also called "Filter Type A." 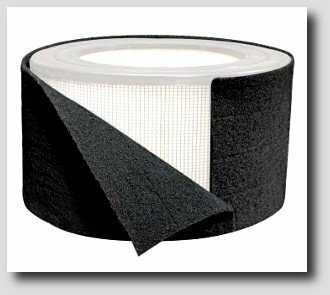 HRF-AP1 is a 15.75 by 45.5 inch cut-to-fit carbon-impregnated prefilter sheet for many Honeywell purifiers. 163 customer reviews of the AP1 prefilter at amazon.com, where this prefilter is a top seller, average 4 stars. The genuine OEM kit has perforations and templates, allowing users to cut out 1 to 8 pre filters, depending on which Honeywell they own. 17000 series owners can get two prefilters, but 50250 folks get only one with about 1/3 waste, cutting the HRF-AP1. Many users find the old prefilter the best template. Or, $12.99 plus shipping at Kaz.com. HRF-APP1, note the extra "P," is Honeywell's Premium Odor-Reducing Air Purifier Replacement Pre-Filter. In my opinion, the premium version is what the old 38002 (replaced by HRF-AP1) was before the quality/price spiral started. A-Plus (HRF-APP1) pre-filters have activated carbon plus zeolite, for better ammonia retention. captures some harmful gases such as Ammonia. Some user reviews mention dust shedding from HRF-APP1, selling for $17 at Amazon. HRF-APP1 is $17.99 plus shipping at kaz.com. Amazon has this for about $7 including shipping. GE SmartAire is a generic 15-3/4" x 48" cut-to-fit activated carbon sheet intended for General Electric brand "GE" air purifiers. The GE version has 18 amazon buyer reviews, averaging 4.8 stars. Made in the USA by All-Filters, Inc. This is my favorite blanket wrap prefilter material, the ones I have used have had negligible out-gassing and almost no carbon shedding. I recommend the "GE SmartAire" generic over all other cut-to-fit products, including Honeywell OEM versions. Owners of most Honeywells, and many other air purifier brands, would be better off cutting their own prefilters from this material, except the rare instances of filter bays wider than 15-3/4 inches. This ships without replacement Velcro strips, so users should not discard the old Velcros. This blanket wrap prefilter requires an accompanying order over $25 to ship. "Honeywell C-6005," an older cut-to-fit generic wrap, has sold for years, accumulating 461 amazon buyer reviews averaging 3.8 stars. Despite the labeling, this is NOT a Honeywell OEM filter, it's a generic. While the quality slippage has affected all the blanket wrap products, "C-6005" provides a good example. Numerous buyer reviews mention subtle changes, like declining thickness, lack of perforations to assist cutting, dropping of Velcro fasteners, odors from new wraps, and messy carbon granule shedding. Amazon has this generic 16 by 48 inch carbon pad for $7.81, currently (08/01/17) shipping free. Made in the USA by All-Filters, Inc., and shipping from and sold by Industrial Filter Sales, "Cut-to-Fit Carbon Pad for Air Purifiers" has decent sales, with 250 amazon buyer reviews averaging 4.4 stars. I bought several of these, which shed fewer loose carbon particles than those from Kaz, but switched to the "GE" linked above after slight out-gassing was noticed. Again, many user reviews note issues - no Velcro strips, thinner, some odors when new. I ordered these Honeywell wrap pre-filters for about 15 years, running a 12500, an even older 14-inch round, and more recently the Honeywell 50250. Product strength, thickness, and quality have consistently declined, in both OEM and generic variants. So, in 2010, I decided to STOP using the prefilter wraps for odor control. Instead of replacing them every 90 days, I cover and protect them with additional prefilter materials, creating a long-lived vacuumable prefilter layer. One huge weakness in the old round design is gaps at the velcroed seam, and all around the top and bottom where the prefilter leaks unfiltered air, with its load of larger particles, into the HEPA. With Honeywell's new modular-stack filter system, even more gaps and air leaks prevail. Most users are tired and disgusted after cutting the grain-shedding material. The majority do not get the line cut straight enough, and the prefilter wrapped tightly enough, to seal the gaps. Then there is the nightmare of trying to wrap the newer Honeywell's stacked modular filters (2, 3, or 4 high) and foam spacers into a tight bundle with the flimsy prefilter wrapped around it. The semi-permanent modified prefilter I use is secured and sealed tightly, solving all these issues. I recently disassembled the 50250 prefilter, removing the silk cloth and fiberglass window screen after three years of use. My outer two layers were clogged with dust, which was hosed off outside after dis-assembly. The carbon wrap prefilter, at least three years old, retained perfect integrity (although doubtless zero odor adsorbing ability), so I left it in place. Now here is the punch line: After saving considerable blanket wrap prefilter costs, my system has allowed this 12-year old 50250 to still run, and perform, perfectly with the original one-piece HEPA filter. I found the rubber bands had melted, so I sewed a piece of fiberglass window screen tightly around the outside, making a permanent vacuumable prefilter. 50250 requires three inferior HRF-F1 stackable replacement HEPAs, at $21 each, NO thank you. In lazer particle counter tests, the 50250 with modified prefilter shows very clean exhaust air, beating my Winix, Sharp, Holmes, and Hunter test models handily. Now, you are probably thinking, "Fine for him, keeping that old carbon in there, with pristine MCS-proofed rural cabin and no indoor pets..."
If using the stacked Honeywell filters, glue the stack together with something nontoxic, seal with scotch tape, before wrapping and fastening the more efficient substitute prefilter materials. Then substitute superior forms of bound and granulated carbon which have become available, putting them in the hollow core INSIDE the round Honeywell. My favorite is the "Moso Charcoal Bag." With the round Honeywells, there is plenty of space inside the HEPA core "donut hole" to just drop in the new Moso Carbon Bags. These nicely-sewed linen bags are filled with much more top-quality odor-adsorbent carbon than any blanket wrap prefilter. There is no cutting and zero granule spillage with the bags. The permanent wrap system and inner charcoal bag will eliminate the cutting, disassembly of wraps, and carbon granule spillage, at a very similar price to the carbon blanket odor control concept. This do-it-yourself project is really no harder than continually buying, cutting, and rewrapping the forty-year-old wrap prefilter design. Or don't do the prefilter modification, just drop in a carbon bag for extended odor control from your round Honeywell. Moso bag with 500 grams carbon is $19.99. Moso Natural Air Purifying Bag, 500gm at amazon.com. The 200-gram size is $8.43. Moso Natural Bag 200g at amazon.com. Smaller air cleaners might need the 50-gram size, two bags for $9.95. Mini Moso Natural Air Purifying Bag, Two 50g Bags at amazon.com. Here is a genuine Honeywell OEM odor prefilter with activated carbon and zeolite, designed to retain ammonia (urine) odors. Genuine HRF-B1 Honeywell filters are white on one side and black on the reverse. HRF-B1 replaces the older CZF-145 prefilter. Tower air purifiers require 2 filters. This one has generic alternatives, but, due to poor user reviews, I cannot recommend them. HRF-K2 reduces odors using potassium permanganate calcite, a bit more expensive than plain activated carbon. HFD-120-Q owners must cut this filter cut to fit. Some user reviews say HRF-K2's are too narrow to span the air intake. $17 at amazon, with higher prices, to $35, found across the web. Buyers who want to save a few bucks could choose the "GE" 48 by 16 inch blanket wrap recommended above and cut it to make multiple prefilters. At the official kaz website, price is $13.99 plus shipping.